Asus has refreshed its G11 gaming PC, and the machine is now available to purchase if you're on the hunt for a new VR-capable rig. 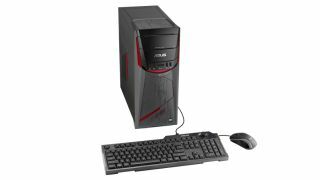 Asus has equipped this machine with enough horsepower to ensure that virtual reality isn't a problem, and it can also deal with 4K gaming while keeping frame rates nice and smooth – if you configure the PC with the beefiest available graphics card option, that is. Namely the GeForce GTX 1080 – or you can specify a GTX 1070 or 1060 – paired up with a Core i5 or Core i7 Skylake processor. And with system RAM, there's up to 32GB of DDR4 running at 2133MHz on the table. As for storage, Asus has included a 3TB hard disk along with an SSD of up to 512GB, and for the optical drive, you can go for a DVD writer, Blu-ray drive, or Blu-ray writer. On the trimmings front, the space-themed case boasts an LED array on the front which can sparkle with some eight million different colors, showing off various nifty lighting effects like a pulsing glow. Ideal for those who like their gaming PCs to be on the showy side – there are also some Mayan-style markings thrown in for good measure. And smart cooling performance is promised, with up to eight air vents on the case, and capacious 5mm side vents dedicated to cooling the processor. Asus also includes its Aegis II software which monitors the PC in terms of system temperatures and voltages, warning you if anything gets dangerously hot. It also boasts the GameAlive utility which lets users record and edit video clips of their gaming exploits, and easily share them across social media. The Asus G11CD is available now over in the US with prices starting at $1,199 (around £920, AU$1,580).